WASHINGTON (AP) - House Speaker John Boehner says Americans have a right to think what they want to think, even when they're wrong about President Barack Obama's citizenship and his religion. Some people believe that Obama, a native of Hawaii, was actually born outside the U.S. or in some other way is not a natural-born citizen eligible to be president. There is also a persistent belief among some that Obama, a Christian, is actually a Muslim. When the host of NBC television's "Meet the Press" asked Boehner whether he, as speaker of the House, had a responsibility to "stand up to that kind of ignorance," Boehner told newsman David Gregory: "It's not my job to tell the American people what to think. Our job in Washington is to listen to the American people." Boehner continued: "Having said that, the state of Hawaii has said that he was born there. That's good enough for me. The president says he's a Christian. I accept him at his word." He later called those "the facts" of Obama's background. Gregory asked, "But that kind of ignorance, about whether he's a Muslim, doesn't concern you?" "The American people have the right to think what they want to think," Boehner replied. "I can't - it's not my job to tell them." 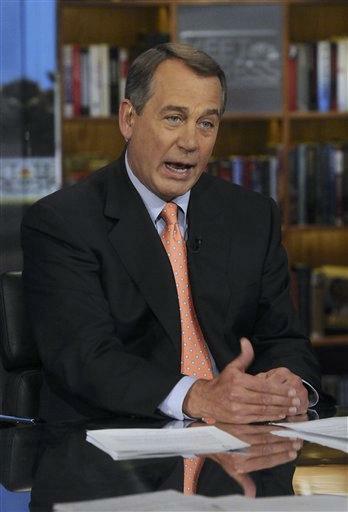 Boehner denied that he is willing to let those misperceptions remain because they weaken and delegitimize Obama.